What Does Eucalyptus Smell Like? Eucalyptus trees have a minty, pine scent with a touch of honey. Due to how closely eucalyptus trees grow to one another, the genus produces numerous hybrids, which results in diverse scents, according to archivist Robert L. Santos at California State University, Stanislaus. There are more than 600 eucalyptus species throughout the world varying in physical appearance and aroma. 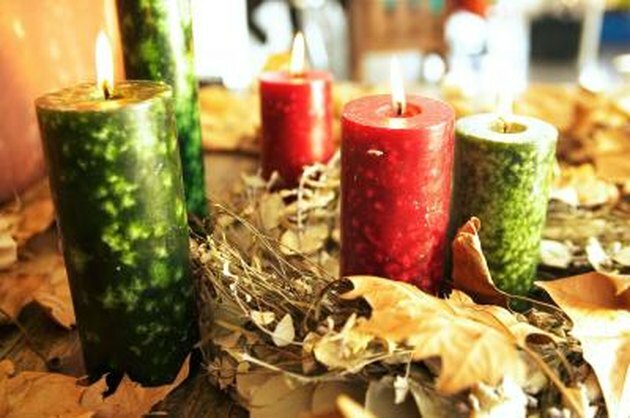 Eucalyptus scented candles fill a home with the tree oil aroma. Walking through a eucalyptus forest, in Argentina, Australia, Brazil or Egypt, for example, you can smell the tree's distinct scent, which comes from the oil inside the tree's fresh leaves. The oil is made of "eucalyptol," which mostly contains terpene and a cymene, organic aromatic compounds. The most common eucalyptus tree, the Eucalyptus globulus "Labill," has leaves filled with 70 percent oil. The oils are used for aromatherapy, massage oils and calming agents. One variety of eucalyptus, the Eucalyptus citriodora "Hook," also known as the lemon-scented gum, has, as its name implies, a lemon fragrance. The aroma comes from the fact that the tree is a hybrid with a citrus tree. The lemon-scented gum tree is most physically recognizable in a grove of eucalyptus because of its shorter height -- unlike other species, it reaches 130 feet, instead of 400 feet. The tree also has naturally peeling bark that has a bluish inner layer. The leaves were used as an antiseptic in traditional folk medicine, according to experts at the Purdue University Horticulture Department. Eucalyptus globulus "Labill" is the most common eucalyptus found throughout the world. Known as the Tasmanian Blue gum, or just blue gum, the tree soars over 400 feet tall at full maturity and is native to Tasmania, an Australian island. The Eucalyptus camaldulensis "Schlecht," also known as the red gum, has a white, tan, or grayish-white trunk, and copper-red branches. The third main eucalyptus cultivar is the lemon-scented gum, Eucalyptus citriodora "Hook." While the rainbow eucalyptus is not a cultivar, but a hybrid, its colors are incredible. The bark peels back naturally to expose a vibrantly multi-colored inner skin of shades of blue, pink, orange, green and purple. The Eucalyptus globulus "Labill" -- or Tasmanian blue gum -- which grows most abundantly in Queensland, Australia, also thrives in California's coastal climate. The eucalyptus grows ideally in humid climates that receive a lot of sunshine and thick fog, which it receives in California's foggy coastal weather north of Humboldt County and as far south as San Diego County. Due to the moisture the trees receive from heavy fog, as of 2002, the eucalyptus grows most successfully on the coast surrounding San Francisco Bay Area, according to Columbia University's Center for Environmental Research and Conservation.